Manufacturers of products made with recycled materials can’t claim offerings were “Made In USA” unless they can show that the materials originated domestically, according to the Federal Trade Commission (FTC) making it the “Made in USA” claims tricky for recycled materials. Responding to a question from a group of jewelers’ associations, the FTC said consumers expected “Made In USA” labels to mean all or virtually all of a product originated in the USA, and manufacturers needed to be able to substantiate that fact. The Jewelers Vigilance Committee, which includes the Manufacturing Jewelers and Suppliers of America, Jewelers of America and other groups, requested an opinion from the FTC on the matter because its members wanted to be able to market products as “Made In USA.” A large majority of jewelry, especially gold jewelry, contains recycled material, however, and that makes the claim problematic in the FTC’s view. Some gold used to make jewelry may have been recycled many times, making it impossible to determine where it was originally mined, according to Rich Youmans, spokesman for the Attleboro, Massachusetts based Manufacturing Jewelers and Suppliers of America. As much as 90 percent of gold jewelry contains recycled material, and some of it may have been mined centuries ago. “We’re all wearing a little bit of Cleopatra’s gold,” Youmans said. Given the long and complex history of much gold, the FTC’s requirement to substantiate that material was originally mined in the USA is not possible for most gold jewelry manufactured here, the jewelers say. And it is likely that the FTC would take a similar view of other products made with recycled materials, said Julia Solomon Ensor, an attorney in the enforcement division of the FTC. For instance, a folding lawn chair might be made of steel, aluminum or other recycled materials. “If, in that circumstance, the marketer said the lawn chair was made in the USA and wasn’t able to back up the claim and demonstrate that their product was made or virtually all made in the USA, that would be a problematic claim,” Ensor said, making the “Made in USA” claims tricky for recycled materials. The FTC bases its position on polls of consumers that show most regard the “Made In USA” label as meaning that a product is entirely or nearly entirely made in the USA. This includes materials used in its manufacture. RELATED ARTICLE: What is American Made and why it matters? If the claim was made mistakenly and the marketer doesn’t seem to be trying to deceive, the FTC might only contact the marketer and inform them of the error. If, however, the claim were made with intent to deceive, the FTC could bring an enforcement action. One option could be a qualified claim. For instance, rather than saying “Made In USA,” the label could claim “Assembled in the USA using Domestic and Imported Materials,” assuming the marketer could substantiate that qualified claim. The marketer might be able to make an alternative claim that conveys that the product is made from metals recycled in the United States, without conveying that the product is entirely or virtually entirely made in the United States. Again, making the “Made in USA” claims tricky for recycled materials. Ensor suggests manufacturers and marketers check with the FTC before deciding to use “Made In USA” claims. She said the FTC will work with businesses to try to devise claims that won’t deceive consumers. Meanwhile, any business that manufactures or markets a product containing recycled materials and carrying a “Made In USA” label may need to be able to prove to the FTC that the recycled materials all originated in the USA. The jewelers, however, still want a more relaxed interpretation of “Made In USA” that would allow them to claim domestic origins for products manufactured using recycled materials that can’t be traces back to their original source. 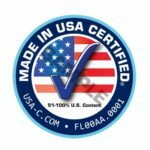 Should recycled products be allowed to use the “Made in USA” claim if the materials were recycled entirely in the USA, regardless of where the original materials were manufactured? Let us know in the comments below. Established in 2010, The Made in America Movement is the leading independently owned, non-partisan organization promoting businesses in the USA, reaching over 520,000 American consumers. If I collect used fabric, that was originally used to wrap around a product that was imported to the USA, and make a new product from it, that I sew 100% in USA, what is the proper labeling? Thanks! Don’t let Facebook censor your news feed!! !